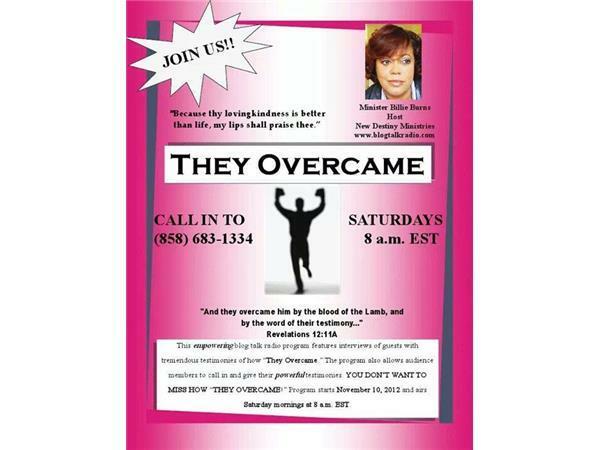 Join us Saturday Mornings at 5:00 AM Pacific Standard Time. We appreciate your support. Call in #(858) 683-1334. Please email us at: newdestinyministries54@gmail..com or mail us any Prayer Request or Praise Reports you would like us to share on the broadcast to: P O Box 750122, New Orleans, LA. Also we welcome you to Like our New Destiny Ministries Facebook page and Twitterpage @newdestiny54. Listen online at www.newdestinyministries54.com to hear our Archives Messages or on Blogtalkradio.com.